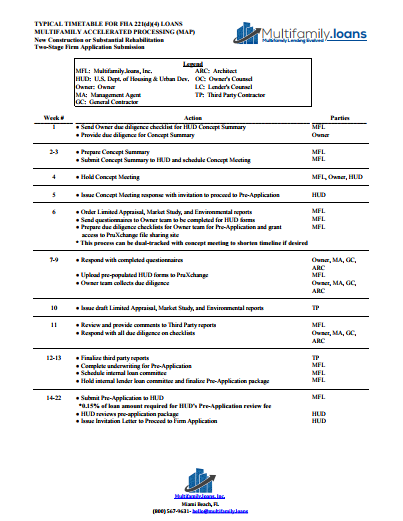 Our timetable reviews estimated timing for each stage of the FHA 221(d)(4) loan process. On average, the entire HUD 221(d)(4) loan process, from initial concept, to final close, takes around 46 weeks. In the first stages of the process, borrowers will need to prepare documents including a concept summary, which they'll go over with representatives from HUD. If HUD believes the project is suitable, they'll invite the borrower to proceed to the pre-application process. At this point, a variety of information and documentation needs to be gathered, including a limited appraisal, a market study, and environmental reports, which are ordered from a third party contractor. The property owner will also have to complete questionnaires for HUD forms. When the correct reports have been issued by the general contractor (usually around week 10), and the lender completes the underwriting process for pre-application (usually around week 12-13), the pre-application will be submitted to HUD. At this point, 0.15% of the loan is due as a HUD pre-application review fee. While it may take some time for HUD to review the application, if the loan seems suitable, HUD usually issues an Invitation Letter to Proceed to Firm Application at around 22 weeks. The next major stage of the process includes ordering a Full Appraisal and Architectural/Engineering & Cost ("AEC") Review from the architect. When this is complete (around week 25), the architect's comments and suggestions on the plans, specifications, and costs can be properly addressed. Then, around week 27, a draft of the full appraisal can be issued. This will be finalized around week 28 or 29. At this juncture, the lender will have completed underwriting for the Firm Application. Around week 30-37, the Firm Application will be submitted to HUD, which will also require another fee of 0.15% of the loan amount. If everything has been done correctly, HUD will most likely issue a Firm Commitment. After the borrower receives a Firm Commitment from HUD, the lender will prepare a Lender's Funding Commitment (around week 38). The borrower will most likely want to take advantage of a rate lock, to ensure that their rates don't rise before closing. A good faith deposit of 0.50% will usually be required to lock the interest rate at this point. Once the rate lock process is over, the owner and their attorney will need to request title documents and a property survey. Then, the lender, borrower, and their attorneys will begin to draft closing documents. Once the final title and survey documents have been received, the lender and borrower will work together to finish drafting their closing documents and submit them to HUD (usually around week 41.) Around week 44, HUD will issue comments to draft closing documents. Then, the lender's and owner's attorneys will work with HUD to schedule a closing date. Finally, by week 46 (on average), the closing documents will be finalized and the loan will close. TO LEARN MORE ABOUT HUD 221(D)(4) LOAN OPTIONS, FILL OUT THE FORM BELOW AND A HUD LOAN EXPERT WILL GET IN TOUCH.